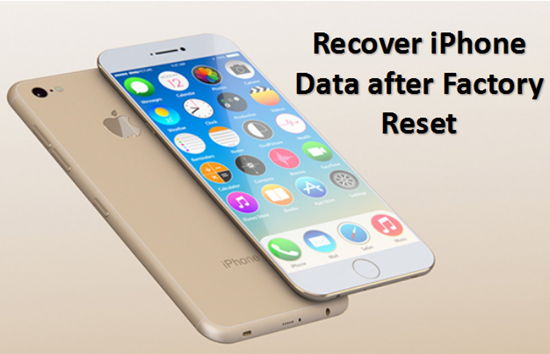 Home >> HOT TOPICS >> iPhone Data Recovery >> How to Recover iPhone Data after Factory Reset (iPhone 7/7 Plus Included). 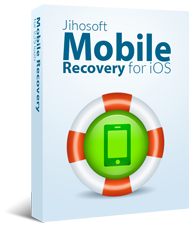 It is always hard to determine whether it is necessary to reset iPhone to factory settings until you fall into the situations like: your iPhone 7/7 Plus/6S doesn’t work due to virus attack or you have to free up the memory as useless files using too much space on iPhone. What We Should Do Before Factory Resetting? Once the factory resetting process finished, you’ll find that all of your contacts, messages, photos, notes, etc disappeared. So you’d better backup your iPhone with iTunes or iCloud previously. 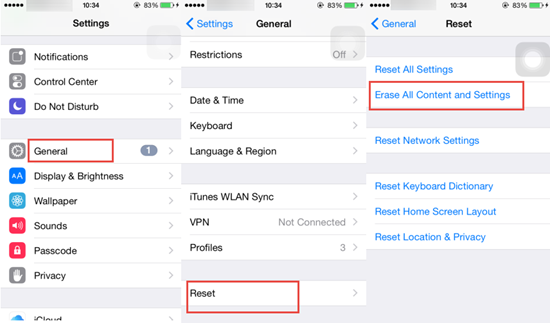 How to Reset & Erase All Content and Settings on iPhone? Go to “Settings” on iPhone and tap on “General”. Scroll down to the bottom of General and click “Reset”. Select “Erase All Contents and Settings” and enter password to erase iPhone. It’ll take a few minutes to reset your iPhone. When it is done, all of your iPhone media and data will be cleared completely. Turn on your new reset iPhone, you’ll notice 4 options: Restore from iCloud Backup, Restore from iTunes Backup, Set Up as a New iPhone, Move Data from Android. Just click “Restore from iCloud Backup” and sign in with Apple ID to restore from the latest iCloud backup. 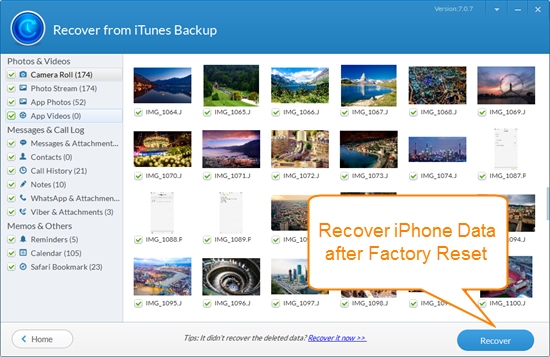 To Recover iPhone/iPad after factory reset with iTunes, you can easily connect iPhone/iPad to computer then go to iTunes and click “Restore from Backup”. However, you cannot choose what to recover. You have no choice but manually delete useless files after restoring. Here iTunes Backup Extractor is highly recommended as it enables you to view iPhone backup files and selectively choose data to recover from iTunes backup file without connecting iPhone/iPad to computer. Get the free trial of iTunes Backup Extractor and launch it on your Mac or Win. Select iTunes backup file from the list and click “Next”. Choose one or more data types and click “Next” to scan. When the scan finished, you can access and select data you want and tap on “Recover”.